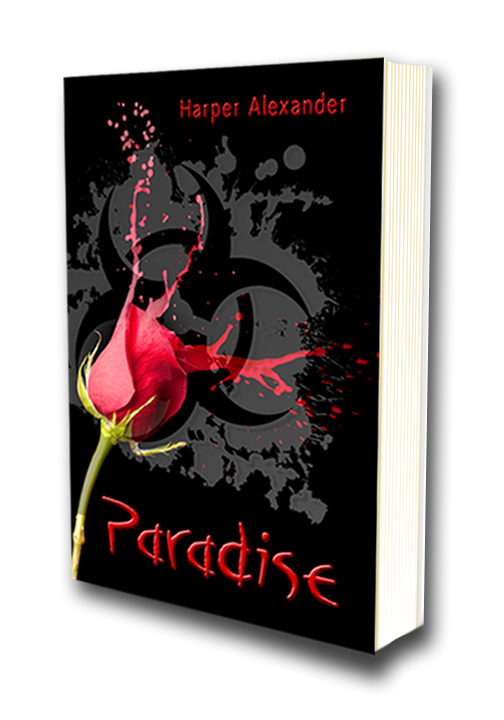 Here is the beautiful cover for Paradise! Categories: Book Imagery, Books, My Books | Tags: book, books, cover, covers, reveal, write, writer, writing | Permalink. I can hear my voice echo in the silence, skipping down the ghost-town streets like a rock skipped over water. But there is no water, of course. It’s barren here. Everything fallen into the cracks of the dry ground. ‘Here’ being this blog. Oh, you thought you were reading an excerpt from one of my books? Ha. I wish. Because then you’d actually be reading this. And I suspect that you’re not. That I’m talking to nobody. I’ve run into a strange phenomenon, here on this blog. Post after post, these days, seems to go straight into some persnickety Abyss intent on sabotaging my connection to the readers I once had. Maybe they’re just not interested in what I have to say, anymore. Maybe I’m not interesting. Except…I can post the exact same thing on another blog, and it gets hits, and likes, and comments. I’ve started running experiments, and, sure enough, without fail, my posts get noticed elsewhere (still on WordPress, mind you, just under other blog names). Just not here, on Harperpages. Is Harperpages cursed? Well, I don’t believe in such things, but it is strangely like clockwork. And I’m not sure what to do about it. Abandon my main headquarters? That’s…kind of out of the question. But I’d rather post excerpts where they’re actually going to get read. I’d rather post news where someone is actually going to notice. I’d rather share exciting tidbits where people are actually going to get excited about them. But, I mean, really? It’s the same stuff, people. Can’t you humor me and rave over ‘Chapter 1’ of my latest book here, instead of on my cooking blog?! I don’t actually have a cooking blog. Since I don’t believe in curses, I’m going to stop this rant now and stubbornly keep posting to this blog, as I always have, and wait for the wayward readers to find their way back. They will. They have to. It’s the same stuff they’re liking elsewhere. They’re just in their rebellious teenage phase. Yes, that must be it. They just don’t want to be seen with me, because I’m the mother, and it’s embarrassing. Everybody loves Mom, but they’ll never admit it. So they show their affection in secret. Where nobody will ever be able to make the connection. Categories: Musings | Tags: write, writer, writing | Permalink. Welcome to Paradise. The place nobody ever comes back from. So reads the tagline I have just assigned to Paradise. Concise, compelling. Yes; that will do. Voila! Cover reveal tomorrow or the next day! In the meantime, the string of rebel inspiration in question is for a book that’s been on the back-burner for years. I’ve been excited about it for years, have wanted to buckle down and write it for years, but have had two conflicting plot ideas to choose between that wouldn’t let me move forward. Well, I finally figured out how to make both of them work rather than choosing between them, and the story just clicked into place, punched me in the face and opened up before me all the way to the horizon, so I had to jump on the inspiration-wave and get to it. So today I’d like to share with you the first chapter. It’s unedited, since I just wrote it last night, but I’m pleased with how it’s flowing. 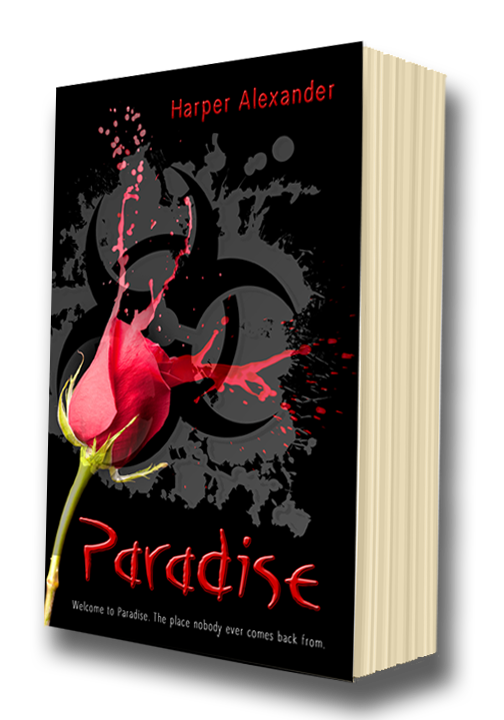 The book is called Paradise, and this is how the thrilling, fantastical dystopian adventure begins. Enjoy! The murky tide dragged itself back out toward the ill-colored sea, bubbling and hissing over a broken mosaic of decaying shells. They prattled like shivering clams in the rivulets of bubbles, always pressing closer, always crawling over one another like a horde of ivory beetles. Now and then a crab walked the carnage, click-click-clicking across the shards, and was quickly snatched off the beach by a dirty-nailed hand and stuffed into a bag of other motley tricks. The people crawled over each other like beetles as well, up beyond the sloping shore and jutting cliff-sides that sequestered the cove. The once-quaint dwellings nestled about the hillsides had been crowded out by secondary shacks, full-up with refugees who had made it across the Badlands to the coast. There was hardly room to breathe, anymore, not that anyone was overly enthused to fill their lungs with the stuff that passed for air. It was difficult to tell if you passed your friends, or neighbors, in the streets, thanks to the gas masks that rendered everyone a similar wasp-like creature. Shiloh never wondered if she passed her friends in the streets. She didn’t have any. Friends were a burden and a risk when survival was such a fierce issue. She knew well that backstabbing was a way of life, when times were desperate, and she had no desire to culture relationships that might compel her to want to care for others besides herself. She was barely getting by as it was. Hoisting her sack over her shoulder, she began to scale her choice cliff-side toward the shelf that hosted her shack. She could feel the crab she had collected moving inside the sack, prodding her in the back as she climbed. A strand of red-tinted dark hair stuttered across the eye pieces of her mask in the sea wind, but she had made the climb too many times to need the crutch of sight to find the foot- and hand-holds. Habit saw her shimmy up the ascension like a spider, and then she was weaving in and out of a cluster of shacks to home-sweet-home. We meet again, you wretched cluster of boarded-up rot, she thought as her rickety door came into view. You had to talk to yourself – and things – when there was no one else to talk to. When friends were few and far between and family was as dead as the crab in her sack was about to be. Shiloh remembered her family vaguely, but they had all been dead by the time she was six. She remembered the struggle to keep a mask on her claustrophobic mother – the panic attacks that kept seeing her mother strip the apparatus off, exposing her too often to the tainted air. Eventually the exposure had taken its toll, her mother’s lungs and body giving out from the radiation and pollution. After that her older brother had fallen while scaling the same cliff Shiloh scaled every day, and her father had wandered grief-stricken into the sickly waves. I’ll fill your shoes. Don’t worry. I’ll be what you never could. And though the panic attacks gripped likewise at Shiloh now and then, a similar case of her mother’s condition running through her veins, Shiloh kept her mask-free indulgences to brief sessions on the rooftops every other night, where she liked to sit beneath the sickly stars and gaze seaward, a scarf tied tightly around her face to filter what it could. With crab in her belly, she sat there now – dark eyes scanning the darker horizon. The ocean fog was a strange color. Gray, but tinged also by a color you could never quite put your finger on. At times brown-ish, sometimes almost violet, and other times still an eerie green hue. Ever-changing, perhaps. Or multi-colored, like a bruise. The world smelled of rotting fish and despair. But also…also vaguely of something sweeter. A prick of something that Shiloh could only ever identify as ‘hope’. Because hers was a shore of hope. People braved crossing the Badlands every year to get to the coast, where they might merit an invitation across the sea to the legendary Paradise. All you had to do was end up being one of the lucky souls to stumble upon a fateful message-in-a-bottle granting you passage, washed up on shore from across the Utopian Sea. Only a certain number of people could be allowed into the gates of Paradise every year, of course, but deliverance from this dystopian world was an allure that had been drawing people to the coast for years, now. Ever since the first lucky soul had taken a chance on his mysterious message-in-a-bottle and sought to escape the doom and despair, and sent back his own bottled memos of the wonders he had found. Those that had followed in his wake had upheld the tradition of sending back accounts of their deliverance, of their newfound pleasures and good health, feeding the hope of those who still waited, stranded on this far wretched shore, for their chance. Shiloh was one such dreamer. Her parents had crossed the Badlands before she and her brother had been born, and so she had grown up on the Coast of Hope. Had grown up watching the sea for incoming vessels – little glass ones that carried with them scrolls of sweet deliverance. Twice, she had gotten her hopes up when she stumbled upon corked bottle-necks protruding from the sand, only to discover the contents were accounts from those who had made the crossing. But it was enough to keep her hoping. To keep her hoping and praying that one day, if she watched the troubled waters carefully enough, it would be her turn to secure an invitation across the sea to Paradise. Categories: Books, Excerpts, My Books, Writing | Tags: author, book, books, excerpt, fantasy, fiction, writer, writing | Permalink.